We started off by catching the train from Milan to Florence. Florence is a lovely city and we walked and walked until I had blisters, just soaking up the scenery. One highlight was a visit to the Accademia Gallery, home of Michelangelo’s famous statue of David. 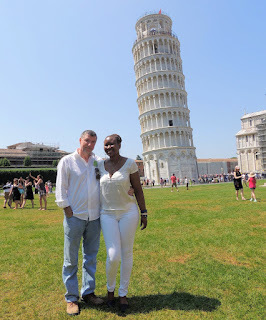 We also did the obligatory day trip to Pisa by train. It was a beautiful though quite hot day, but it was good to see the (in)famous Leaning Tower. Next we travelled by train to Tirano, a lovely town in the north of Italy and jumping off point for the famous Swiss scenic train, the Bernina Express. The scenery was magnificent. We overnighted at Tiefencastel in eastern Switzerland and next day travelled on another renowned scenic train – the Glacier Express. It was another beautiful journey, and a few hours later we alighted at the town of Brig in western Switzerland. Brig is a beautiful town – Malaika and I stayed there for a night in 2010 in the winter, so it was really nice to see it in summer. From Brig we caught a regional train to Zermatt and then the Gornergratbahn up Mt Gornergrat where we stayed the night at the Kulmhotel 3100. The hotel is so named because of its elevation – 3,100 metres. 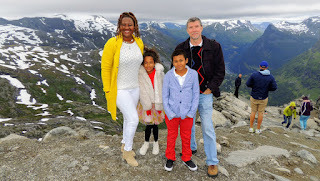 The views were breathtaking – not just because of the altitude! The next stop was Montreux, a lovely city on the eastern shore of Lake Geneva. One day whilst there we caught the ferry across the lake to France and had crêpes for lunch. Délicieuse! Our journey continued by train to Zurich and then onwards to Sargans – another scenic town. From there we caught the bus to Liechtenstein where we’d planned to have afternoon tea, but couldn’t find a cafe! So we ended up having ice cream in Sargans instead and then caught the train back to Zurich, where we boarded the overnight sleeper train to Hamburg. In Hamburg we stayed in the same hotel that the kids and I stayed in in 2012 when we did the Baltic cruise. In fact I think we even had the same room. It was quite close to the main train station, so quite convenient. In Hamburg we boarded our cruise ship, the MSC Splendida, for a two week cruise to the Arctic. 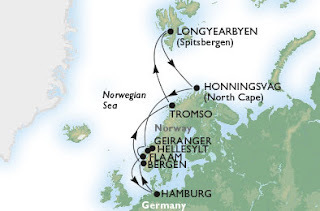 The cruise was one of the most enjoyable I’ve had, with stops in Bergen, Tromsø, Longyearbyen, Honningsvåg & Norkapp, Geiranger, Flåm. Bergen was lovely and we indulged in some fresh raspberries and cream. Tromsø is another town that Malaika and I visited in 2010, so again it was nice to see it in summer as opposed to winter (even though in summer it was 12 degrees and raining!). Likewise, Longyearbyen is where Malaika and I ventured in 2010 hoping to see the Aurora Borealis. In winter it was a surreal place – no daylight at all, just dark and cold and windy. In summer it was beautiful and we especially enjoyed the Husky Safari. Lunch at the SvalBar was so enjoyable that we ended up going back there for dinner. Best burgers north of the equator! The remaining three stops in Norway were all incredibly beautiful. Standing atop the huge cliffs at Norkapp with a bitterly cold wind blowing in your face and watching the sun set late in the evening makes one quite introspective. In Flåm we caught the scenic train up to Myrdal and then cycled the 20 odd kilometres back down. Words alone can’t possibly describe the beauty of the scenery. Thankfully, hopefully, the photos will. After arriving back in Hamburg, we caught the train to Berlin where we walked many, many kilometres enjoying the sights. 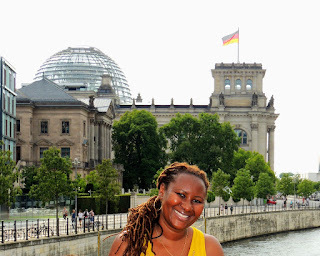 I don’t know what it is about Berlin, but I love visiting the city.